Tomato Dosa - Colorful and Flavourful..
A big hug and thanks to the Dosa queen for sharing this recipe. 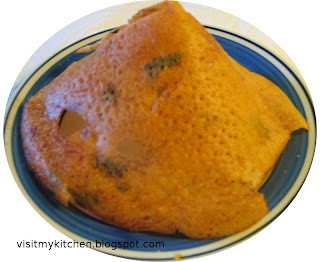 :) I have made few variations to suit my taste..
- This dosa is best eaten while hot as its made only with rice. -Though ideally this dosa needs to be done from outer to inner, some tavas really dont suit this style. For instance the authentic iron tava that we get in India will be quite hollow towards centre with raised sides. These are ideal to make outer-inner dosas. But unusually my pan here is little raised in the centre and slanting bit down towards edges ;) so when I try outer-inner, all batter still goes towards edges leaving centre empty. So depending upon your pan, use a method that suits. Wash well soak raw rice for 3 - 4 hrs. As Pavithra has mentioned, it is advisable to soak in warm water. Drain and grind along with Tomatoes, sour curd,red chilli,salt adding water as required. 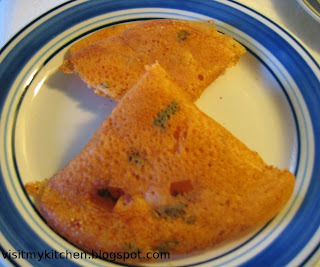 Make a thin batter to get crisp dosas. Add Cumin, chopped green chilli, coriander, curry leaves. Set aside for 20-30 mins. Add 1 sp of eno fruit salt just before making dosas. Heat tava well, drizzle oil, pour the dosa from outer to inner , close cook for few seconds, flip and cook other side till crisp. Thats looking so good .. but i hope u made lot of changes sounds interesting.. By the way y did u add eno salt ? just curious to know. And if ur using raw rice u have to soak in warm water so that it will be so good after a long time too. Even in cooled dosa really u can enjoy the flavour of tomato fully. Color of the dosa has come out great.. feel to eat dosa again..THanks for trying this and letting me know dear. U have made the dosas really crispy and nice! love this dosa.Looks so yummy. Dear Pavi, thanks for the comments :) Yah I made quite few changes as I dont prefer coconut and wanted green chilli etc..
Eno salt is a healthy substitute for Cooking soda. Adding it gives a good porous fluffy texture...So i add it in few of my recipes..
nice recipe..looks deliicous..i love the second picture a lot..
Oh sowmya thanks for letting me know abt eno salt dear.. i add it only for dhokla so as u said is substitute for BAking soda i think i will try it to use for some like rava idly all those type of recipes correct ? Yes Pavi, Eno salt is basically Cooking Soda + citric acid,I guess. It acts as a good sub. for cooking soda. You can add for Rava idli, add it just before steaming idlis.